British (English) Field Marshal who served in many campaigns, including the Crimea and Indian Mutiny. ALS. 3pp. War Office. 15th October 1886. 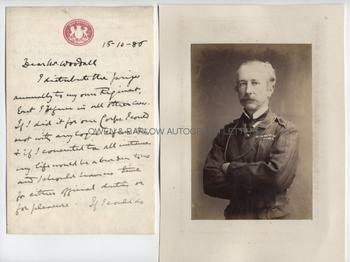 To [William] Woodall.Together with a fine contemporary portrait photograph. 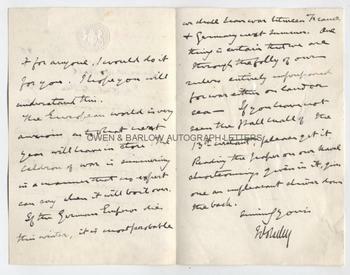 A fine letter in which Sir Garnet Wolseley talks of impending European war and British unpreparedness. "I distribute the prizes regularly to my own Regiment, but I refuse in all other cases. If I did it for one Corps I could not with any logic refuse others and if I consented to all instances my life would be a burden to me and I should have no time either for official duties or pleasure. If I could do it for anyone I would do it for you. I hope you will understand this. The European world is very anxious as to what next year will have in store. The caldron of war is simmering in a manner that no expert can say when it will boil over. If the German Emperor dies this winter, it is most probable we shall have war between France and Germany next summer. One thing is certain that we are, through the folly of our rulers, entirely unprepared for war either on land or sea. If you have not seen the Pall Mall of the 13th instant, please get it. Reading the paper on our naval shortcomings given in it, gives one an unpleasant shiver down the back". 8vo. 7.5 x 5 inches. Mounting damage to blank verso of last leaf, which has "skinned" the paper in places but all else is fine. 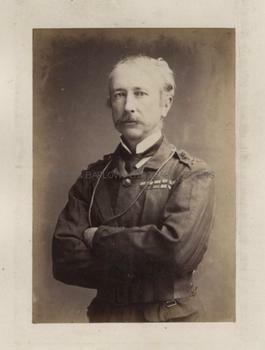 The photograph is a very handsome 19th century gelatin silver print, showing Sir Garnet Wolseley in uniform fatigues or battle dress, half-length, with his arms folded and looking confidently at the camera. It measures approx 5.75 x 4 inches (excluding mount) and is laid down on card from an album leaf. It is in fine condition. Both the letter and the photograph are from a 19th century collection made by the radical Liberal M.P., William Woodall. 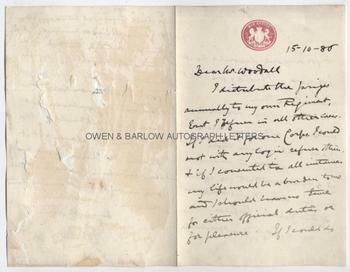 Woodall was Surveyor-General of the Ordnance and, subsequently, Financial Secretary to the War Office under W.E. Gladstone and Lord Rosebery and worked closely with Sir Garnet Wolseley when the latter was Quartermaster General.